An exquisitely draped vintage evening gown to cap off the week... this is a Charles James design from 1936. I find that patterns often detract from the sophistication of sculptural gowns, making them look busy or sporty, but to me the large feathers printed onto the silk here complement James' design beautifully. What do you think? Photo from 13bees, via my new favourite book. Title from Emily Dickinson's poem. 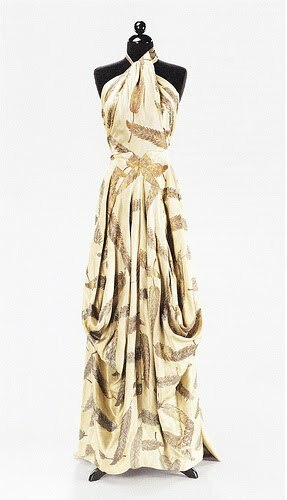 Posted by la femme at 3:20 p.m.
it is one of the most lovely dresses i have evver seen in my life! i wouldn't mind t as my engagement dress actually... thnx for sharing.. i liek the title as well, is it a quote or did u come up with it?